In response to a call by former First Lady Michelle Obama and the Partnership for a Healthier America, the Y expanded its longtime commitment to supporting healthy living by adopting a set of Healthy Eating and Physical Activity (HEPA) standards. Based, in part, on years of research with key partners, the HEPA standards will build a healthier future for our nation’s children by creating environments rich in opportunities for healthy eating and physical activity. Since 2015, the New York State YMCA Foundation has received $1.7 million in legislative grants through the State Budget to support the implementation and expansion of the HEPA standards in YMCA youth programming across the state. Check out our HEPA IN NEW YORK STATE Infographic to learn about the reach and impact our healthy living initiative has made on the Empire State. 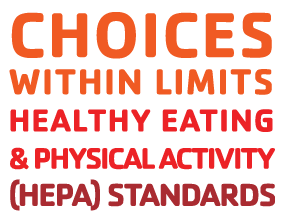 Check out the YMCA’s Choices Within Limits HEPA Guidelines for Early Learning and After School programming.